The decline of America economically, influentially, financially and in liberty is well documented. Something that has been written about by both friend and foe alike. This decline, if not already clear enough, was on parade in Asia the week of the twentieth. During President Obama’s trade mission to Asia he experienced what has to be one of the biggest diplomatic and economic flops of all times. In an incident most have not even heard about the President was completely and utterly humiliated. The debacle happen on the President’s trade mission to Asia. The President wanted to create a free trade pact with the top Asian economies excluding China. The countries in question not only shunned the President and his proposals, they created there own free trade initiative. The main difference between the two plans is the one the Asian countries came up with included China and excluded the U.S.! This was definitely a case where the description of adding insult to injury is apropos. Just as amazing as the turn of events is the fact it was covered by almost no one. The story can be found in its entirety in the Asia Times but virtually no where else. It all happen in Phnom Penh, Cambodia. 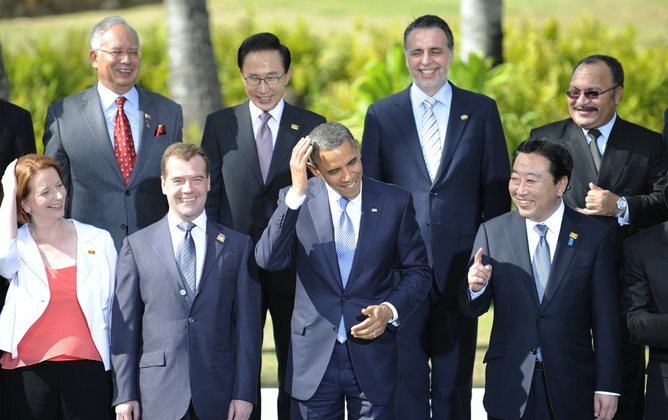 Obama was there to sell the idea of his Trans-Pacific Partnership (TPP) plan. Unfortunately most of the countries didn’t want to be part of his plan or anything to do with a pact that includes the U.S. As the Asia times put it “this grand, game-changing vision mattered only to the sad, strange people who concoct policy in the bowels of the Obama administration. America’s relative importance is fading.” In fact the Asia times puts most of the blame for America’s diminishing relevance smack dab on President Obama. Now it is possible something maybe salvaged out of the grand embarrassment. Obama might get some of the countries at some point to sign on to something but the grand vision of the TPP is dead. Any agreement signed at this point will likely be hailed as a great victory for the anointed one but all the spin can not hide the truth. The Phnom Penh summit showed just how far the U.S.A. has fallen. Today the world is looking beyond the U.S. as much as to it. They see its economy in decline and its position in the world less relevant. An exceptional place no more. Welcome to USA 2.0, a place being remade to fit the liberal vision of what the country should be. Welcome to Obama’s America.